Argy's plaster cast has been removed. 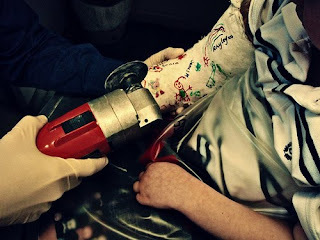 The joy of a liberated arm was bettered only by the use of a noisy power tool. The hard white shell has been kept as a temporary souvenir - a reminder of five weeks of tricky bath-times; funny dressing; and victorious cast weaponry (never take on a sibling sporting half a kilo of plaster). Was he brave? It must be a little daunting having a power tool that close to your arm! Two arms are better than 1!! That's impressive bravery and machinery! Hooray for the removal of the cast. Sending you lots of well wishes for it to never return!!! Excellent. But I can't believe you mentioned not a word about the smell. Niiice. Was his arm all shrinky and wrinkly under there?